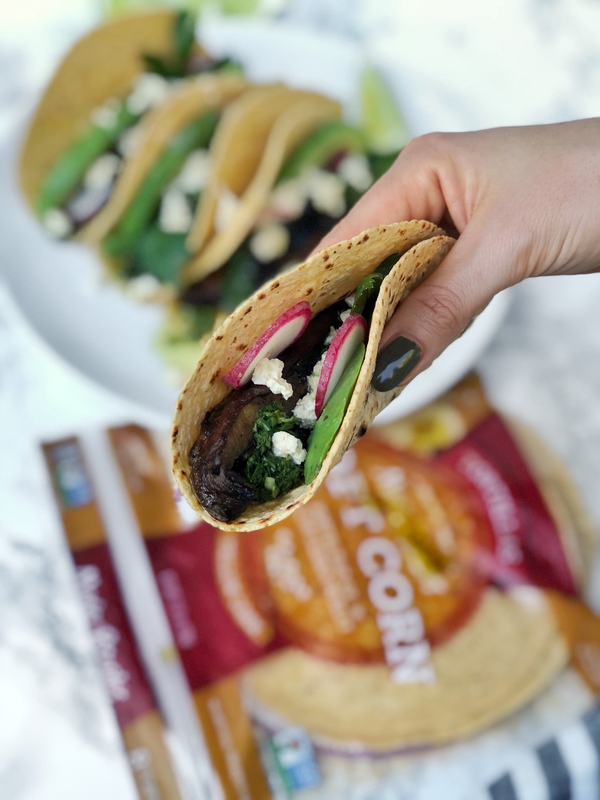 Roasted Portobello Tacos - Are You Kitchen Me?! Get ready for Taco Tuesday! 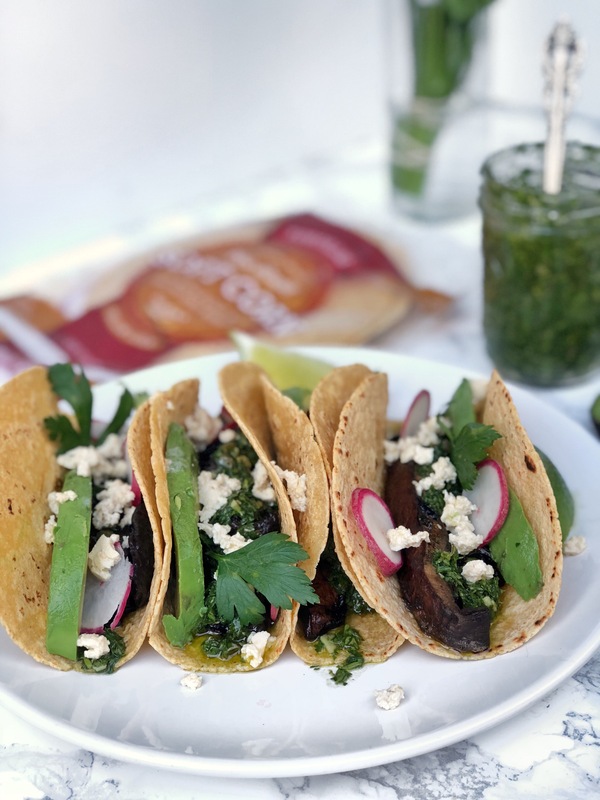 Or, honestly, any day because you’ll want to enjoy Roasted Portobello Tacos all week long! My love for tacos is not a new affair. Evidence here, here, and here. There was once a time where I ate tacos for three meals a day for at least two weeks… Best days of my life. Ok, ok maybe I’m waxing poetic here but tacos are definitely my love language. Personally, I am a fan of corn tortillas but I’m extremely picky about quality. I prefer to make my own corn tortillas but if I do buy them, they must be authentic and made fresh. The international grocery store is usually a good place for tasty tortillas but I recent discovered a new brand that I am in love with! Maria & Ricardo’s tortillas are made with minimal natural, non-GMO ingredients. The company has also always been owned by Mexican families, giving me peace of mind that the recipe is in the best hands. 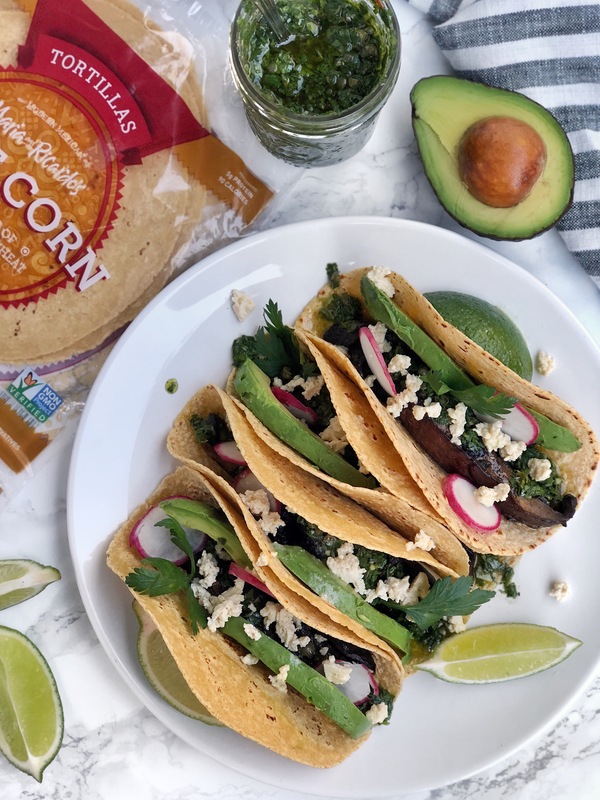 While they have a full line of flour, corn, whole wheat, and gluten free tortillas (all of which can be found at your local Whole Foods! ), my favorites are the taco- sized corn tortillas. This variation is made with both corn and wheat flour, which gives them the perfect texture. They taste fresh and authentic and don’t break when you load them up with fillings! Speaking of fillings… I desperately wanted to keep it simple with this recipe. But alas, being the massive overachiever that I am, I loaded up my tortillas with all the accouterment. If you do nothing else, make just the mushrooms and the green sauce. I promise that alone will make for some of the best tacos of your life. In between huge bites of four tacos, I said to John: “these are the best tacos I’ve ever made.” I’m confident that is not an overstatement. Preheat oven to 425F. Lightly oil or spray a baking sheet lined with parchment paper or a silicone mat. Slice the mushrooms into 3/4'” strips and place in a large bowl. Add the balsamic, soy sauce, and oil and toss gently to coat all of the mushroom pieces. Place the mushrooms on the prepared baking sheet and roast for 12 minutes, until tender. Meanwhile, add all of the chimichurri ingredients to a food processor (I use a mini one) and pulse to combine. Set aside in the fridge until ready to use. To assemble the tacos, toast the tortillas in a very hot pan or over an open flame until pliable and lightly charred. Place 2-4 pieces of mushroom, a few slices or avocado, and a drizzle of chimichurri in each shell. Garnish with radishes and tofu feta, if desired. Enjoy! I used this recipe for the tofu feta but I’ll be honest, it's not my favorite. I would recommend using significantly less vinegar and a bit more salt. I’m going to keep working on my own recipe and let you know if I come up with something good! I was compensated for this post but as always, all opinions are honest and 100% my own. Thank you for supporting the brands that make this blog possible! 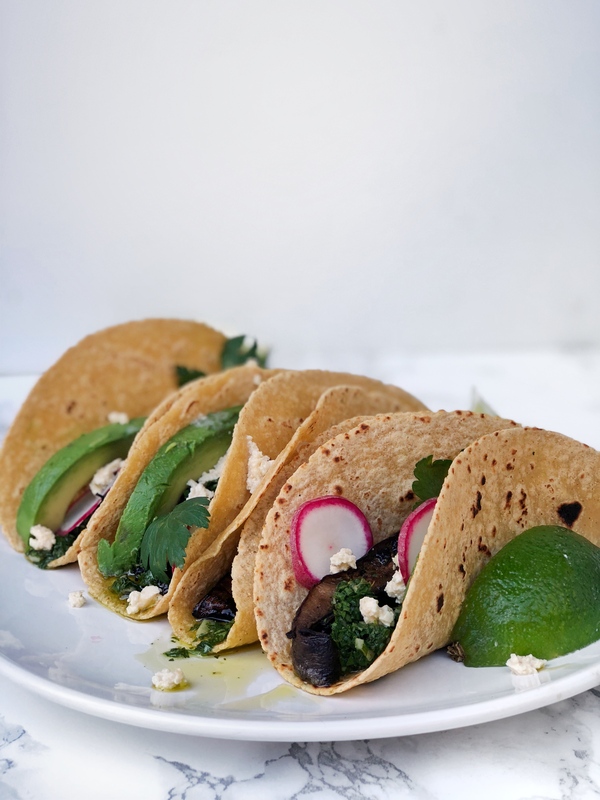 Portobello tacos are the best!